Bags are made from different materials but few match the sturdiness and elegance of felt bags. Look around and you would surely find someone carrying felt backpacks or messenger bags around you. Felt being an extremely versatile fabric makes it an ideal material to work with. 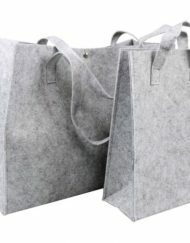 Different styles and designs can easily be achieved with this fabric and we supply you with the best felt bags online. At Organza Bags we pride ourselves in being one of the biggest wholesalers of felt bags in UK. We have always seen ourselves as trendsetters in the business and bring to you high quality products. Whether you are looking for wool felt bags or a simple yet chic felt handbag you won’t have to look beyond our collection. As an online store competing in a crowded market we have created a distinctive identity for bringing out new products at regular intervals. If you wish to buy the trendiest felt shoulder bags or felt tote bags for your friends and family will find products that sets trends for others to follow. Felt shopping bags are extremely popular these days and it presents a great platform for businesses aiming to enhance their brand equity. Gift these bags to your employees, vendors or customers and they would carry your brand name whenever they go out for shopping. We offer these shopping bags in different sizes and quantities to serve your niche needs. At Organza Bags we have created a strong reputation in offering handmade felt bags at highly attractive rates. Each product is an expression of art and reflects quality craftsmanship. This has helped is become one of the leading wholesalers of felt purse, felt messenger bags and felt handbags in UK to name only a few. Our talented designers and craftsman constantly bring out new bags that are chic and high on the functionality quotient. We understand that every client has different needs and hence offer you wide choice of options. From colour and styles to sizes you will always find what you are looking for at our online store.